I love eggplant but I understand that some people may be on the fence about it. There is the potential slime factor and sometimes it has the tendency to get a little chewy and bitter but not if you make it like this. This is my favorite way to eat eggplant. Crispy on the outside, tender in the middle and seasoned just right. I could eat them right out of the oven like this and together with the garlic and basil dip it’s amazingly good. 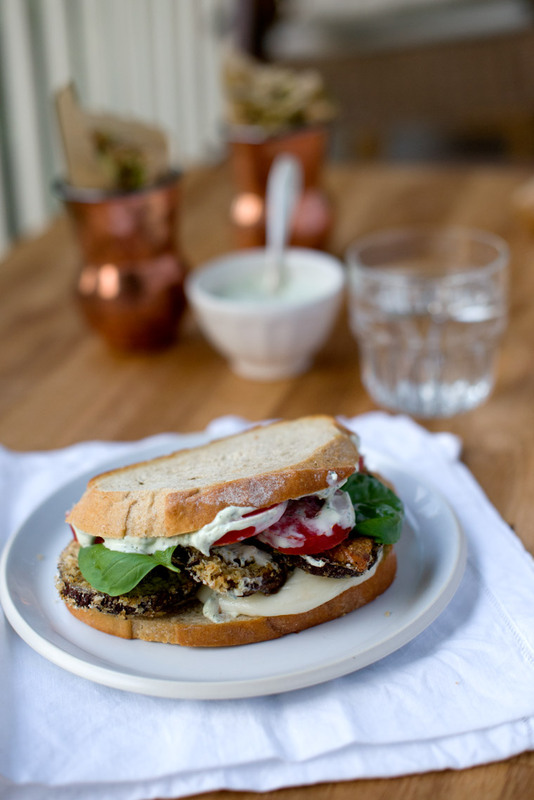 Put the whole thing between two slices of bread and you’ve got one helluva sandwich. Oh yes and these ‘fries’ are my new favorite way to eat zucchini. Totally crispy – flavorful and fun to eat. 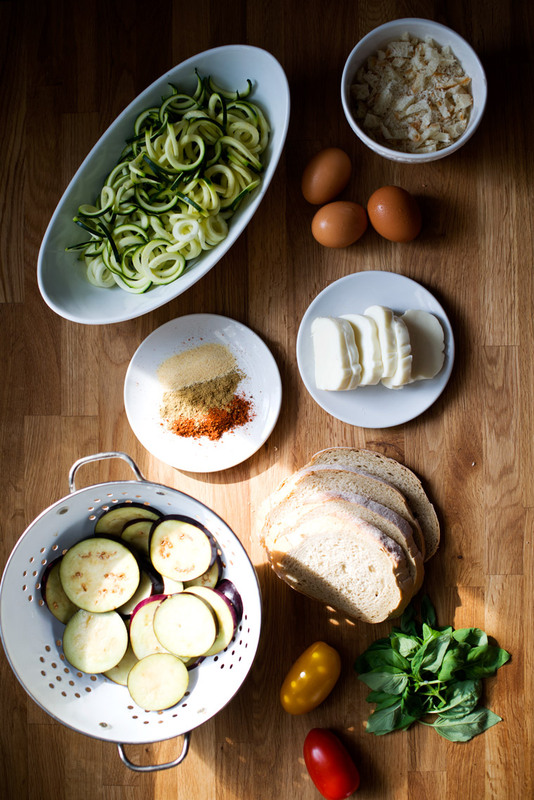 Cut zucchini into thin strips using a vegetable peeler, julienne peeler or veggie noodle maker. Coat them with egg and then toss them in bread crumb mixture. Bake the zucchini fries on 400 F near middle rack for 20 minutes until brown and crispy. Salt eggplant slices and let drain. Dry well. Coat in egg then coat in bread crumb mixture. Drizzle with olive oil. Bake at 400 F between middle and bottom rack. Start by slicing and salting eggplant. Let drain for 15 minutes while you work on the next steps. Slice zucchini with your favorite veggie peeler. Coat in egg and then coat with dry flour / spice mixture. 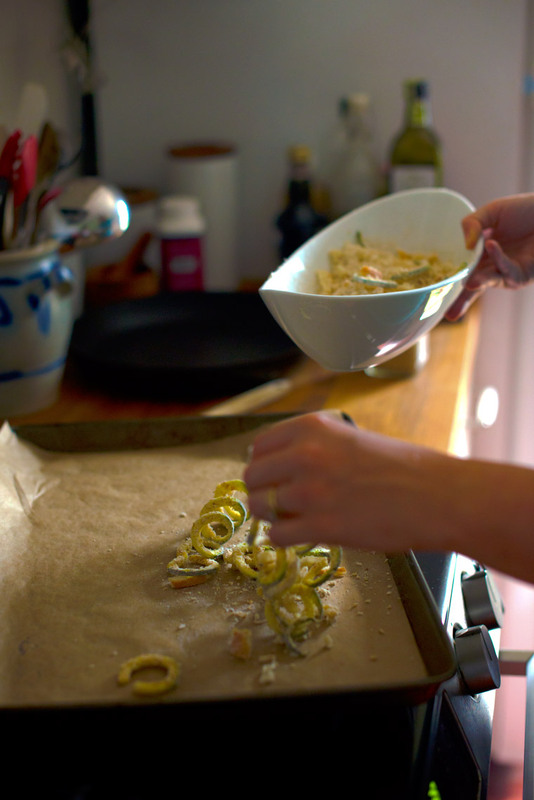 Spread veggie noodles out on parchment papered baking sheet. 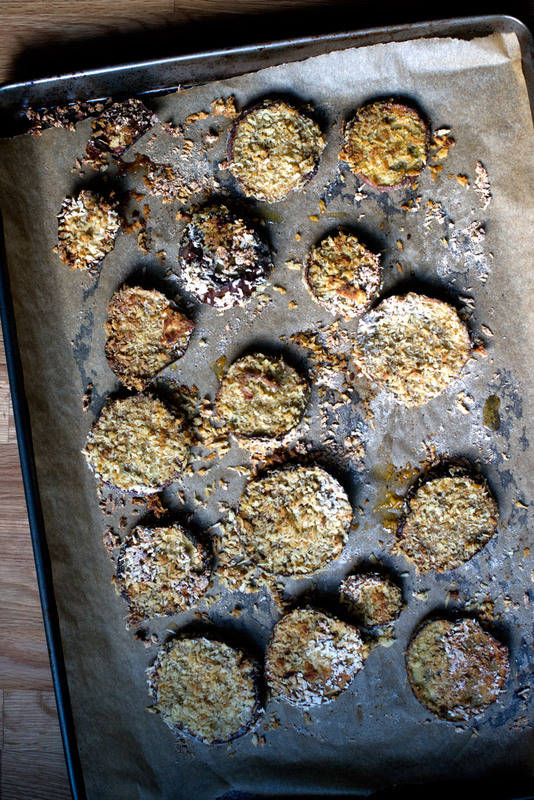 Bake for 20 minutes until crispy on 400 F. Coat the eggplant the same way you coated the veggie noodles and bake. While the vegetables are baking make the yogurt spread. Combine all the ingredients in food processor or finely chop basil and press garlic and mix together. Assemble sandwich and enjoy. Hello there! Just found you through Pinterest, and I am so smitten! 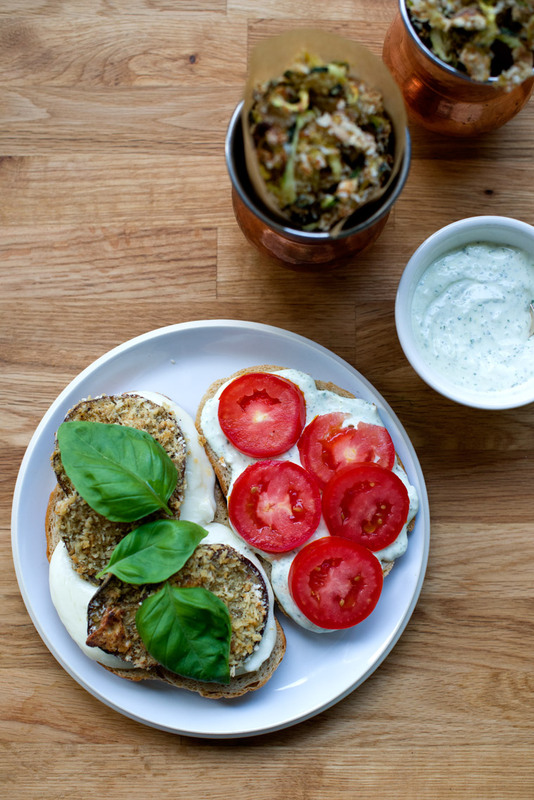 Your blog is beautiful, the photography stunning and yet completely easy and real…and I have a super, suuuuper, almost mushy soft spot for eggplant. I am so sold. Side note: I just completed a road trip through the South and stayed a night in Charlotte. Wish I would have known you then! I could have used some local foodie recs. Hey Eggplant Sister! Thanks so much for this sweet comment – made my day! Next time you’re passing through give me a shout! 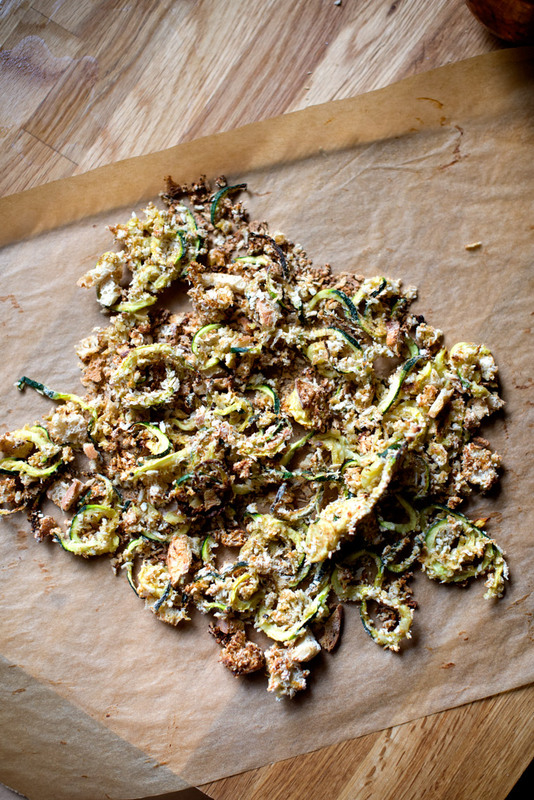 Zucchini curly fries?!! I am SO sold – can’t wait to try them! Also, beautiful photos! So, I’ve had a vegetable peeler, the one where u would do a zucchini like this and no clue what to do with it!! 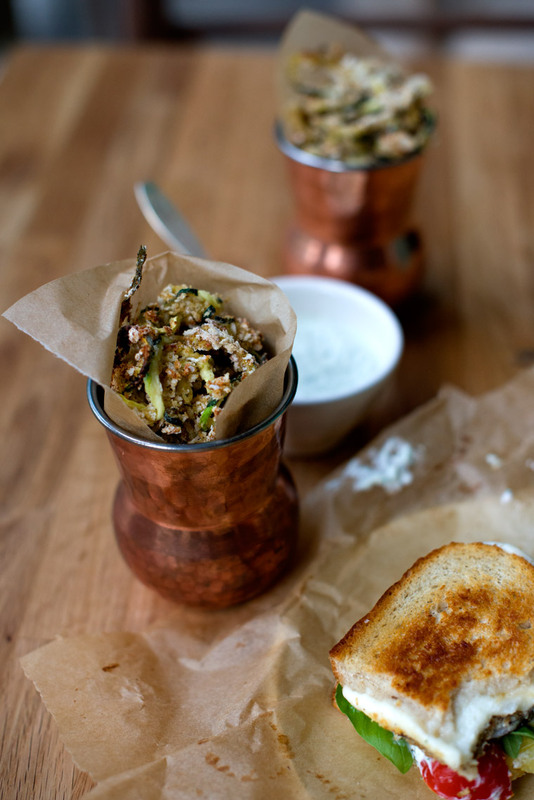 Love zucchini and squash so I think this would be a great recipe for me to try!! Unfortunately nowhere closeby to purchase Eggplant, but will have to keep this in the back of my mind!! Looks so yummy!! Excited. Can’t wait to get a zucchini! !